Relief texture World Map at 4 km resolution showing land and sea-floor relief in smoothed color variation based on elevation. The map is sized at 10,800 x 5,400 pixels, giving a printed size of 72 x 36 inches at 150 dpi, or 36 x 18 at 300 dpi. 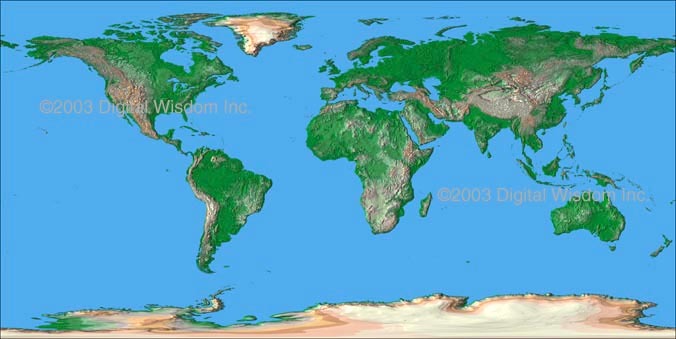 This map is supplied with the Illustrator EPS vector map to build a composite world map with geo-political features. comprises 5 relief map images and matching vector geo-political map of the World; using Photoshop and/or Illustrator, a designer can create highly customizable maps for any media publishing project.